We are fortunate to have several local farmers markets to choose from in our area. We've always gone to the same one but last week, we wanted to try one that's a little closer to our new house. It's in the perfect location, in the heart of downtown Montgomery. 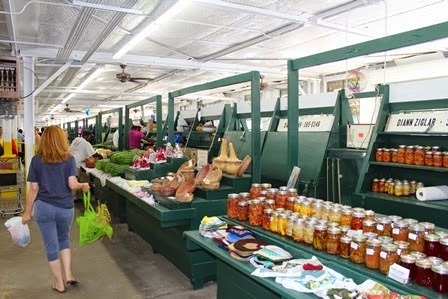 The market looks small from the outside compared to the State Farmer's Market we usually attend but it's so efficiently laid out that once inside, we quickly realized that there's twice as many vendors! The first booth we came to had a very nice couple that I stopped to talk to about homemade pickles. As we were chatting, I noticed that Caroline had wandered to the booth next to us and was chatting with the little lady behind the table. Before long, she came around the table and was squatting next to Caroline showing her something. I was still in conversation and J. was standing close to Caroline and paying attention to the conversation so I turned my attention back to pickles. In a few moments, Caroline walked over to me, holding a parsley plant. Knowing that she loves flowers and plants, I figured she just picked it up to show it to me and ask if she could buy it. I quickly excused myself from the conversation and the couple I was chatting with said, "It's ok, she really loves to do that." Having no idea what they were talking about, I headed to the next booth with Caroline to return the plant. The first thing I noticed was a small hand written sign that said, "Free Butterflies" laying on the table next to another sign that invited people to "Please touch and smell the plants!" Before I spoke the lady came over and told me how Caroline was and how she reminded her of her own grandchildren, whom she missed dearly. She said she'd given the parsley plant to Caroline because there was a caterpillar among the leaves and she just knew that Caroline would LOVE it. I looked down and sure enough, there was a bright green caterpillar clinging to a stalk. I thanked her and made sure Caroline did the same as J. and the other kids came up to see what we were doing. Noticing the big kids belonged to me, she encouraged them to take a plant for themselves. She spent the next few minutes talking to them about the types of plants she had available and how to care for them. Jillian and Keller each chose a plant and we bought some mums from her for the front porch and left. These types of interactions are quite common at the farmer's markets here. The people are so kind and so excited to see families together enjoying the fruits of their labor. Our kids really look forward to our trips and I think this sweet lady will become a good friend that they look forward to seeing each time we go. I'll make it a point to take pictures of their plants to bring to show her that they are caring for them the way she told them to. A few things about caterpillars. One, they aren't really that entertaining to watch. We spent hours over the next few days watching Diamond (of course, he needed a proper name!) and it was about as much fun as you'd imagine. Two, they poop a lot. It's really gross. Three, if you look really closely at their face (is that really what it's called?) it looks like they have a constant frown. Or a mustache. Several days after we brought Diamond home, we came home from school and he wasn't on the parsley. We noticed that he'd climbed up the blinds and was nearly at the top. 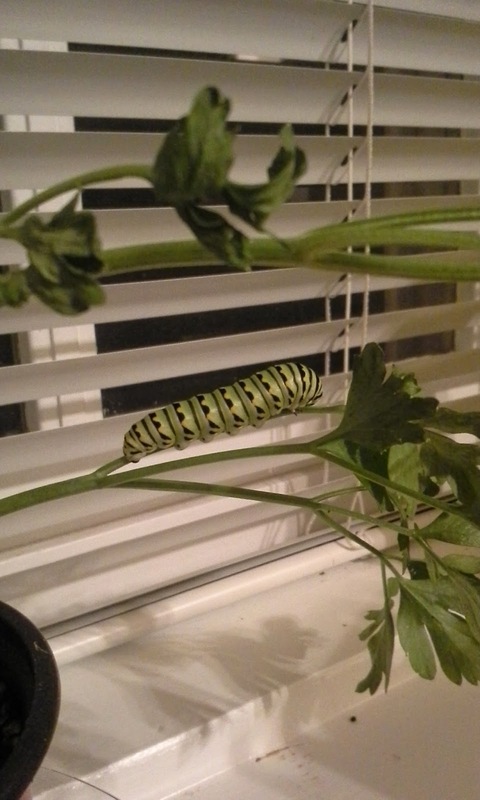 J. brought him back down and put him back on the parsley so he wouldn't be lost. The next morning, he was dutifully climbing back up the blinds. Keller mentioned that he was probably looking for a place to form his chrysalis. We let him climb and I checked on him periodically throughout the day while the kids were at school. 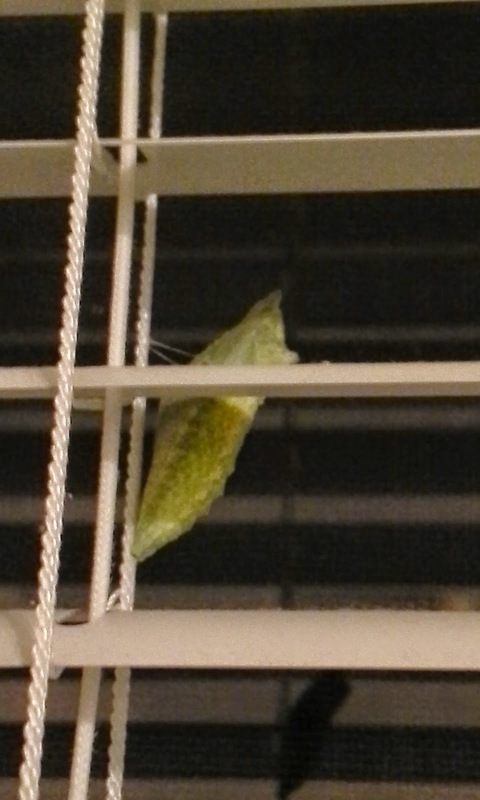 A while after they got home, we checked on him and he was fully inside of his chrysalis! So, we're apparently growing a butterfly in our blinds! I know next to nothing about caterpillars/butterflies so we've been reading about the stages and what is happening inside of the chrysalis. He should be out in a couple of weeks and we'll release him into the yard. You can't even imagine what a huge deal this has been for everyone in this house. So much fun! Here's a couple of pictures of Diamond. Keep in mind, he's cocooned up in our blinds so it's hard to get a great shot!